Home > Mark Your Calendar!!! > “Track Life: Images and Words,” by Juliet Harrison. Launch Party November 16th! “Track Life: Images and Words,” by Juliet Harrison. Launch Party November 16th! I’m searching for some new adjectives. I know so many equine photographers–some are good; a few are great and a handful have talents that are otherworldly. Heaven-sent. God-given talents. So I’m sick to death of hearing, reading or writing that so-and-so is “gifted.” “Passionate,” or “talented.” All are adjectives that have been used to death–either because all are words that perfectly describe the abilities of an artist–or because the writer doing the describing doesn’t know all-that-many big words. If you come up with any better adjectives to describe a photographer who approaches every horse as if s/he is sacred…every moment of life as if it’s precious…please share. I need some new describers. That said, I’d like to introduce you to the works of an equine photographer with whom you may be familiar already. Forgive me if you’re already a fan, or friend of Juliet Harrison. But if you are not-yet familiar with her works, her art and her heart–allow me to include you in this invitation to a par-tay on Saturday. This par-tay will celebrate the launch of 92 pages of Juliet’s gorgeous, soulful photographs and the words of some pretty terrific–dare I say, “renowne”–writers. You should meet Juliet if you don’t know her already. Ergo, you should head on out to Oblong Books in Rhinebeck, New York this Saturday, the 16th, for the launch of Juliet’s first coffee table book with her new Publisher. I laud Juliet, for she is a strong, warrior woman spirit–she’s had trials and tribulations, as do many of us–but instead of lying down, rolling over and surrendering–she picks up her camera and her heart and finds a horse in whose soul to nestle, and records that experience, to share with the rest of us. Last year sometime, I was approached by Juliet to write a page or so for her book. (At that time, it was her unnamed project.) Juliet would provide photos of the racetracking life–and her writerly friends would bring the words that hopefully helped tell a bit about our obsessive relationship with these horses and this sport. Juliet had asked 20 or so racing writers and insiders to contribute to the book. To be included in this volume, along with writers the likes of Mrs. Mary Lou Whitney; Frederic Lenclud; Cindy Wyrick Bledsoe and Brendan O’Meara was an honor, indeed. So I wrote a blurb–and the aforementioned fabuloso writers wrote blurbs–and those blurbs came together with Juliet’s stunning horse racing photography to create Track Life: Images and Words. But it is true that Rhinebeck, New York–home of Oblong Books and the launch on Saturday–is smack-dab in the middle of some darned beautiful horse country. 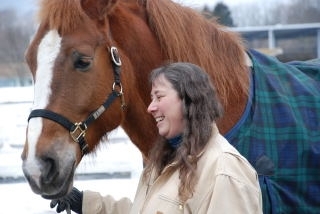 And that, wherever horses live–there, too, are folks who are nutty about equines. I’m not sure how many books will be on-hand at the store the evening of the launch, but I know that also, you can order them via The Paper Trail Press. The holidays are coming, friends: I don’t know what you celebrate. (For me, it’s Christmas and Festivus.) 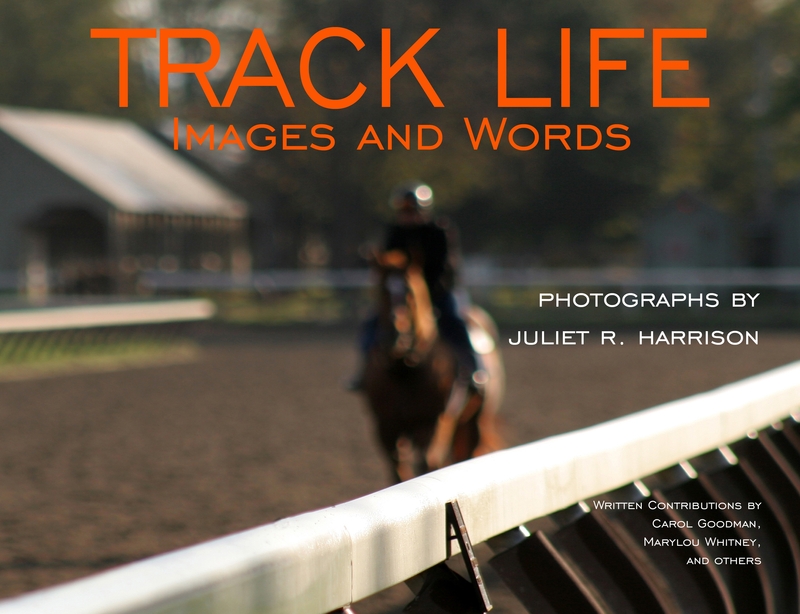 Track Life: Images and Words is THE perfect gift for your horse-loving friend, lover, barn manager, boss, daughter, son. For anyone who loves horses, racing, profoundly beautiful photography and the issue of some terrific scribes. I know a ton of people who’d love to see this book under their tree, bush or Festivus Pole. Come on out to Oblong Books on Saturday evening, November 16, 2013: meet Juliet Harrison, and hear her discuss her inspiration to create this, her first book with her new Publisher–and surely just the first of many. Buy a copy–or 10–of Track Life: Images and Words, or put in your order to receive it before your holidays commence. Previous Article Perceptions, Part 1: Desiree Gill and Simone Montgomerie: Warrior Women, Jockeys, Alphas Extraordinaire. Next Article Thanksgiving 2013: The Race Track Chaplaincy of America/New York Division…and You…Me…Us.